Twenty-five years ago “offshore” was a dirty word. We had to travel from the Netherlands to the Caymans and then to Panama and back to Lichtenstein till we could gather glimpses of highly classified information that would enable us protect our own assets in a predatory economic environment. Today, anyone can do a Google search and get hundreds of services that will incorporate companies anywhere in the world. Reputable law firms have a lot of experience in pushing forward the paperwork flawlessly. But that’s the easy part. 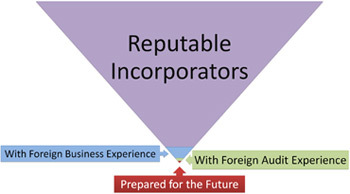 Very few have a clear understanding of the needs of the foreign businessman or investor. Even fewer have undergone an audit in the USA, Canada or Europe. It is those consultants that deserve to command the high fees. But, it’s money well spent because past experience is valuable. Positive thinking is important and self-fulfilling prophecies may be a fact. It’ll be so nice to lean back and dream of a beautiful world with governments serving the citizens, the judicial system protecting the working class, doctors healing everybody and schools educating our future generations. But the wise must take precautions. The rumor of a devaluing US dollar has now become a question of when and by how much. With the shrinking supply of oil, raw materials and commodities the other currencies will have to follow. The necessity to clean up the environment and repair or replace the aging public infrastructures is putting a lot of pressure on all governments to raise taxes. Would the G20 nations start imposing foreign exchange restrictions? Would the governments of the G7 invent new ways to put pressure on the international banks and offshore jurisdictions to tighten up and squeal on their clients? How can the foreign investors protect themselves before these measures become news - because then it’ll be too late? Future information to answer these questions is priceless. We cannot publicize these answers prematurely because it’ll defeat the purpose. But our inner circle of clients will have the guidance to react and protect themselves before it’s too late.